Of course we won't let the last week of April pass by without giving out a few more boxes of cupcakes, now would we? And since it's the end of April, the generous Jes of Little Louie's Cupcakes and I will be picking out the 3 best entries and will be awarding them a box of cupcakes each! I'm a/an (insert cupcake flavor), because ________. Which cupcake flavor are you? You might just win a box of cupcakes too at http://bit.ly/JnDabj! 4. Comment on this post with your Facebook name, e-mail and direct URL of answer/post. 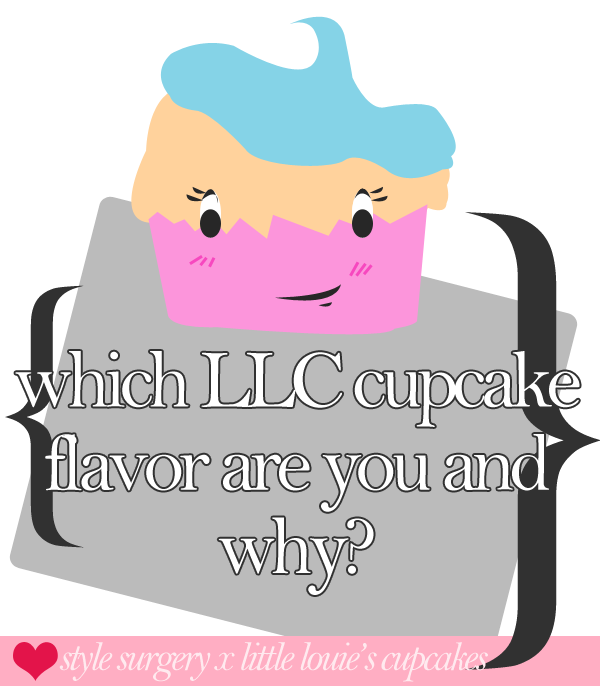 * You can see the list of LLC cupcake flavors at their Facebook page (photos). * Entries will be accepted until Sunday (April 29, 11:59PM). * THREE winners will be picked by Little Louie's Cupcakes and Style Surgery, and will win a box of cupcakes each! * Winners should be able to pick up their prize at a meet-up point to be agreed upon with LLC.